Cloud computing, using shared resources in public spaces instead of in-house IT organizations, is the latest thing in IT. Lines of business even bypass their own IT shops to take advantage of external providers of cloud offerings. However, many of the users that employ public cloud services have not considered issues involving security, compliance, and availability. Cloud represents a new business model that requires a process discipline as well as the use of a corresponding set of technologies. The new model requires an understanding of the hardware configuration, software images, a virtualized storage infrastructure, and network management. For many organizations that have mainframe resources, the IT professionals already manage these different disciplines and aspects of resources as part of their overall management of the platform. The mainframe’s proven capability to efficiently and securely provide virtualization, combined with the existing skills in the IT organization, suggest that in-house mainframe resources provide an ideal environment in which to pilot cloud computing. 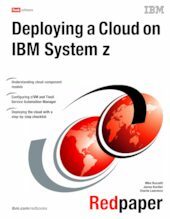 This IBM® Redpaper™ document describes the steps we took to create an environment that can efficiently deploy and manage a cloud in a Linux®-based Infrastructure as a Service (IaaS).